Red stucco tapes are designed to stick securely and tear easily for fast and efficient prep for buildings before the stucco application starts. The reason red stucco tape is red is to easily distinguish it from masking, painters, electrical, and duct tapes. Stucco tapes can be used on wood, masonry, metals, vinyl, stucco, and painted surfaces. Stucco tapes are often used around door and window frames to protect from damage during construction. It can also be used as masking to protect from dust, debris, and overspray. Stucco tapes can be used on interior or exterior applications. A good quality stucco tape is uv resistant. Uv resistance provides protection for the surfaces beneath the tape the harsh effects from sunlight in outdoor applications. It is also resistant to a large temperature range. This tape will hold up in both warm and cold temperatures. Tapes also have a weather resistant backing which sheds water. This is because stucco tapes are made from polyethylene, a blend of natural and synthetic rubbers. The stucco tapes are so resistant to water, it can even be used in marine applications. Not only does red stucco tape hold up against water, tapes can resist most paints, polymers, acids, chemicals, solvents, and alkalis. Most cements and plasters are very alkaline in nature. Red stucco tape is used in many plastering, concrete, and stucco applications because it can stand up to the alkalis in cementitious materials. Red stucco tapes are frequently used on the seams of eps foam boards in the eifs application, creating a continuous insulation system that is highly effective due to the alkali resistance of the tape. Since most paints and stuccos are acrylic based, it is imperative that stucco tapes be alkali resistant. Stucco tape was designed to stick securely but remove cleanly. Stucco tapes are so strong they can be used to hang poly plastic sheeting or window film but gentle enough remove easily in one piece. These tapes are designed to adhere to irregular surfaces and hold tight around curves and corners. The tape is easy to apply and will stick firmly and securely. Upon removal, red stucco tape will lift of most surface easily and cleanly in one piece, without tearing. Once removed there is no damage to the surface or undesirable adhesive left behind. 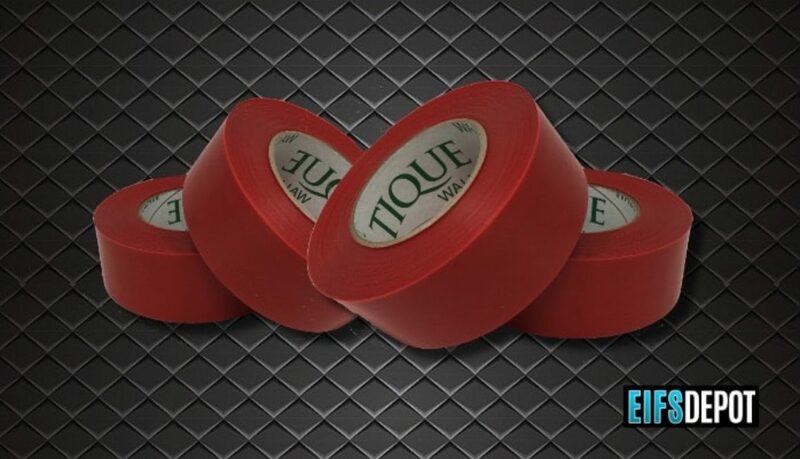 Red stucco tape is a durable UV resistant tape that can be applied to many irregular surfaces. Stucco tape is resistant to moisture, most acids, paints, alkalis, chemicals, polymers, solvents, sunlight, and extreme temperatures. Stucco tape can be applied to most wood, masonry, metals, vinyl, stucco, and painted surfaces. Stucco tape is easy to pull from the roll and tears easily. Stucco tape will stick firmly in all types of weather. When removed, stucco tape will pull up easily in one piece without tearing and will not leave a sticky residue. Perfect for holding up plastic sheeting, on seams, protection around window and door frames, and as masking in for over spray. Red stucco tape will leave you with clean paint lines and no mess. Mechanical Fasteners are primarily used when installing EIFS (exterior insulation and finish system). Mechanical fasteners are used to attach EPS (Expanded Polystyrene) foam board to plywood, osb, and light metals and other approved substrates. Extruded polystyrene (xps) and polyisocyanurate foams can also be used in the place of EPS foam board. Mechanical fasteners are designed so the screw will pass through EPS foam and the washer will stop the head of the screw from passing completely through the foam board, countersinking the plastic stop washer and leaving the surface flush. This is very important because installers may need to rasp any uneven Foam surfaces and then apply a layer of Basecoat Adhesive on top of the eps foam board with a trowel and embed Fiberglass Mesh into the Basecoat. Mechanical Fasteners are comprised of a pre-assembled galvanized steel screw that is coupled with a high density, impact resistant two inch plastic stop washer. The large diameter of the washer provides strong resistance to positive and negative wind loads. The recessed channel with the plastic closures over the top prevent moisture from passing through, bleeding of basecoat, and prevents thermal bridging, as well as covering the screw head so that there is a flush surface. The recessed area of the fastener makes it so very little Basecoat adhesive to is needed to fill the indention in the EPS board. When installing an EIFS system with mechanical fasteners, it is important that one use an air and moisture barrier such as stucco wrap. In a system attached with adhesive, a roll on barrier is used which creates a membrane to protect the substrate from air and moisture vapor. A roll on barrier should not be used on a mechanically attached system because the screws penetrate the membrane therefore defeating the purpose of a water and air tight membrane. In addition to using a moisture barrier, an installer must be sure that areas around windows, doors, soffits, and the roof line are properly flashed. One significant advantage of using mechanical fasteners is that you do not have to wait a day for adhesive to dry as with a system that is attached with adhesive. An installer can attach the EPS foam, basecoat and install fiberglass mesh on the same day. Since the washer and screw are pre-assembled, a mechanically attached system can be installed fairly quickly. It is recommended by most manufacturers to use one fastener per square foot for proper strength. It is important to follow architect specifications, local building codes, and manufacturer’s recommendations when installing an EIFS system. Different regions may require either a system attached with adhesive, mechanically attached, or a combination of the two due to humidity, average temperature, and/or wind speeds. Some regions may need to be attached with both adhesive and fasteners. 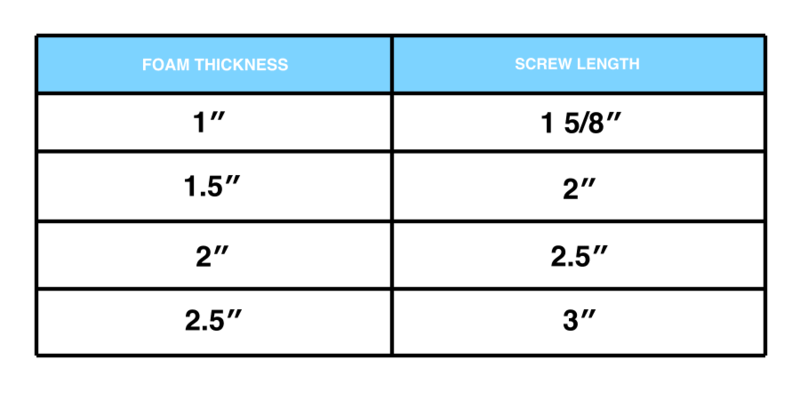 When purchasing pre-assembled mechanical fasteners, the key is to buy a fastener with a screw length that is slightly longer than the thickness of your foam board. See chart below. Also called Foam Board, Expanded Polystyrene, Insulation Foam, Aged Foam Board or the Foam. The insulation board is attached to substrate in the EIFS application either with adhesive or Mechanical Fastener (glued or screwed) depending on the type of substrate and the water barrier that is used in the system. 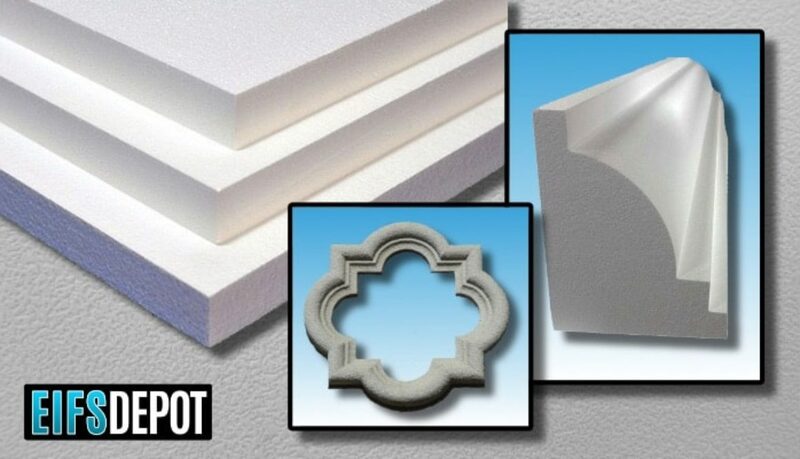 Our Styrofoam EPS foam board is compatible with multiple manufacturers of synthetic finishes. 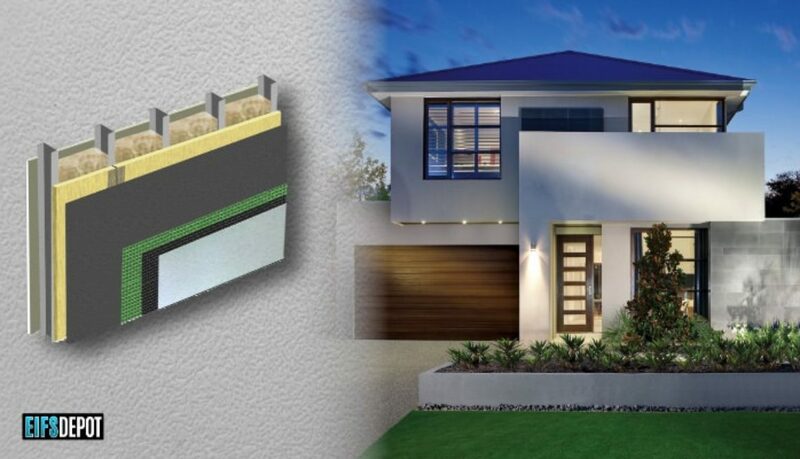 In addition to aesthetic appeal, EPS Aged Foam Board provides numerous structural benefits by creating weather tight air seals, easily filling voids, and creating barriers to improve energy efficiency. Make sure you read our BLOG post about the two ways to attached EIFS. When the substrate is plywood, OSB, or Densglass and Tyvek Stucco Wrap is used, then the system would likely be attached with Mechanical Fasteners. 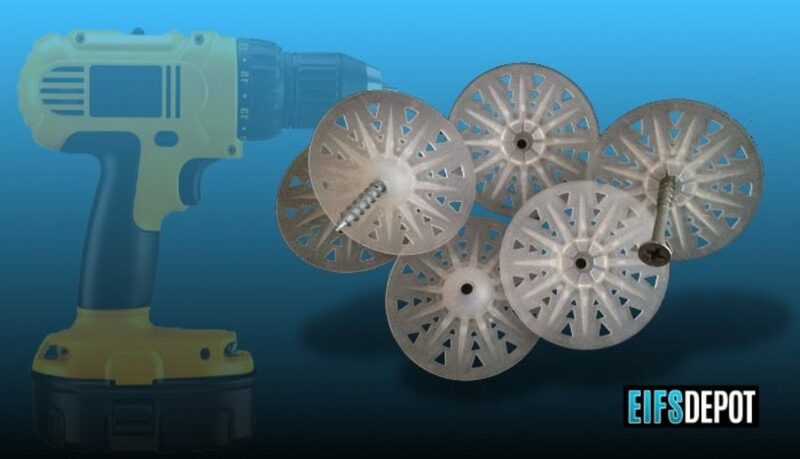 Mechanical fasteners are screws with a 2″ plastic stop or plastic washer which will countersink into the EPS board without passing through the foam. Your fastener length should be slightly larger than your foam. For example: If you are using 1″ foam, then you should use 1 5/8″ fasteners. If you are using 2″ foam, then a 2 ½” fastener should be used. When the substrate is concrete or masonry then the EPS board will be attached with Basecoat Adhesive. The Basecoat adhesive should be applied with a notched trowel, thereby creating a vertical drain plane. Also, if a roll-on water vapor moisture barrier, such a TIQUEGUARD, is used then the EPS board should be attached with Basecoat Adhesive, even if the substrate is made of wood so that the barrier is not punctured with Fasteners. Custom shapes are used for trim, window sills, cornices, bands, headboards, starter corners, keystones, wall caps, brackets, moldings, columns, and other design elements. The shapes are cut from large foam billets with a hot wire machine from a detailed drawing that includes dimensions. Custom shapes are simple to order and affordable. Shapes can be quite intricate or just a simple band. Also ask about our line of adhesives for adhering ‘foam to foam’. Please call: 1 (866) 375-9510 for more details on custom shapes. There are a few ways to safeguard against moisture becoming trapped behind your EIFS. A roll on secondary moisture vapor barrier, such as TIQUE AQUAGUARD will protect your substrate from damage by moisture. After applying the secondary moisture vapor barrier, a drain plane made by using a notched trowel and applying basecoat adhesive should be created, using it to adhere your EPS insulation foam. The use of a weeped starter track at the lower termination point is crucial to the completion of this system. The use of Tyvek Stucco wrap between your wooden sheathing and EPS insulation foam will wick away any moisture, therefore protecting the wood from damage. Stucco wrap is attached to the substrate with mechanical fasteners. It is important to note that stucco wrap differs from house wrap in that house wrap is used for siding and improves air and moisture flow providing insulation, whereas stucco wrap is fluted and works as a drainage plane, forcing moisture out of the EIFS system. For more information call our highly trained sales team at 866.375.9510. North American builders began using Exterior Insulation Finishing Systems in the 1980’s. First in commercial buildings, then applying it as an exterior finish to residences. This was mostly used on wood framed homes using the same techniques that had been successful in Europe. EIFS is cost effective compared to Traditional Hard Coat Stucco. The other added benefit about EIFS is having a layer of expanded polystyrene Foam that serves as exterior insulation. There are many areas in North America where EIFS is popular. The most popular areas are in the Northern United States, the Midwest, Texas, and Canada. 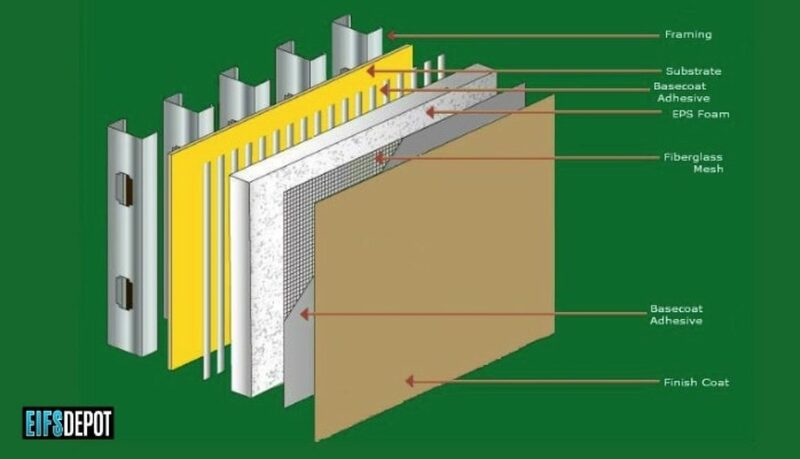 Inner Layer Foam (EPS Board) Insulation Board that’s secured to the exterior wall surface, often with Basecoat Adhesive or Mechanical Fasteners. Middle Layer. A Polymer and Cement Basecoat Adhesive that’s applied to the top of the insulation, then reinforced with Fiberglass Mesh. Exterior Layer. A textured Finish coat. The two main systems in EIFS: the Adhesively Attached and Mechanically Fastened System. ©2019 EIFS DEPOT. All rights reserved. EIFS Depot is Proud to offer superior EIFS/ CI and stucco supplies at great prices. Call us today for info on Hard Coat Stucco, Plastering, and Drywall material. We supply Metal Lath, Fiber Sanded Stucco and various trim pieces in different sizes. Are you are looking for corner bead, casing bead, tools, fasteners or expansion joints... we are your 'go to experts'.